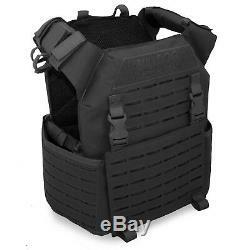 The Bulldog Kinetic Plate Carrier has been designed for professional users such as Military, Police or Close Protection. As the name suggests the Kinetic is lightweight, comfortable and does not restrict movement allowing the operator full mobility and speed. Pockets for ballistic plates on front and back; Compatible with SAPI and other similar sizes plates. Optional Side Plate Pouch Cummerbund that can hold any plate/soft armour up to 26 x 16 cm. Laser cut MOLLE on the front, back and sides for the addition of pouches or other gear. The cummerbund can also be removed and the carrier used on its own. Fully adjustable padded shoulder straps with loops for hydration and comms routing. 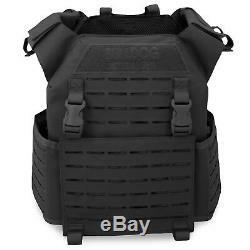 One of the main features of the Kinetic Plate Carrier is the removable velcro panel and two Quick Release buckles on the front; By removing the velcro panel you can attach the Bulldog Kinetic or FLI Chest Rigs directly, not need to change pouch configurations manually. Also great for removing in a rush if bugging out. YKK zippers, tracks and buckles throughout. Pockets for ballistic plates on front and back. Compatible with most 10 x 12 Inch Plates. Laser cut MOLLE to reduce weight. 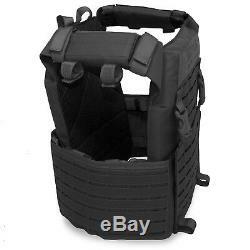 Modular velcro panel and buckles allow compatibility with the Kinetic and FLI Chest Rigs. Weight (w/ Standard Cummerbund): 1300 grams. We've Got You Covered. All Bulldog equipment is built for combat and will not let you down. Made from sturdy yet lightweight materials and backed by a 2-year guarantee against faults with the materials or workmanship. Normal wear and tear not included. M = 30 up to 39 inch waist. L = 32 up to 51 inch waist. 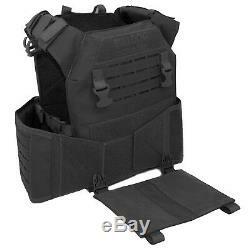 The item "Bulldog Kinetic Military Army Tactical Police MOLLE Armour Plate Carrier Black" is in sale since Monday, September 11, 2017. 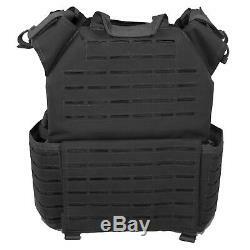 This item is in the category "Collectables\Militaria\Surplus/ Equipment\Armour". The seller is "ukmcpro" and is located in Portsmouth. This item can be shipped to North, South, or Latin America, all countries in Europe, all countries in continental Asia, Australia.